Blogger is the best (content-management-system) Platform which becomes more and more popular these days due to its high prominent features. You might have noticed that since from the couple of years there is a huge increase-ability on blogger platform with billions of users. Now its become the top 10 CMS system throughout the world. Google official has included so many additional features inside blogger platform but unfortunately blogger CMS system is still uncompleted and have few limited features. Blogger Developer is still hard working on this platform & trying to upgrade more and more additional features to make it perfect SEO friendly and becomes the no1 CMS system throughout the world. What Happen If We Create More Than 20 Static Pages in Blogger ? 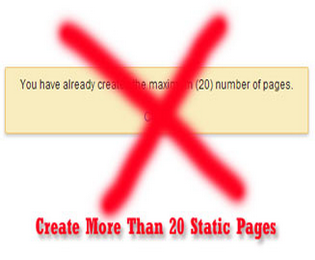 Now how to solve this issue so that we can easily have more than twenty pages in blogger blog. just follow the below steps carefully read each one with attention and also try to practice on them. Now lets come to the points. Follow the below given steps carefully one by one. And implemented on your blogger blog. Now go and delete this page which you have copied the url. Do,not confused we will get it again. Now to delete this page click on pages option and delete the same page which you have copied the url. Now create new page note that this will be considered page number 21. if you cont it from page number 2. Now again we have 20 static pages in our blog if we counting it from 2 to 21. Now we can easily retrieve our old page number which we have deleted in first step: To retrieve that page Click on new tab on browser and past the URL of that deleted page which you have copied earlier. Now you will see the result that the deleted page is appearing on screen. Now just simply click on publish button. Repeating the same process as many times as you want the number of additional pages in your blog. No doubt an amazing trick Hafeez bro to create more static pages in our blog. I always like to read your posts because you explain them so perfectly. Great to see you in your next post. Yes dear we should write for newbies not for pro bloggers. if newbies understand it easily then there is no doubt that everyone will easily understand thats why i give brief explanation. Dear Best of luck and see you soon here with my next tutorial. Happy Blogging!. thanks. try to at least say something about the post. Do not only make your goal of only making the backlinks. Hope you will understand. Well Rizwan brother we like to have a voiced with loyal readers. we want a readerships we always trying to write a competitive post on everything. thats is. thanks for appreciation. we like to see you here all the time. Hope to see you again. Thanks Arshad Majeed for saying too cute words about me. We always want to make a readership with our loyal readers. i hope you will also one of them. hope to see you here soon in my coming tutorial. Dear Hafeez I want to do guest posting on your blog so can you send me instructions? Thanks Steve For appreciation. Keep visiting PBT for latest updates. Thanks buddy. awesome blogger tricks, i am aware that it is possible but you show me how to create 21th page in blogger thanks a lot hafeez..
Umesh Brother we have already mention the methods on to add 21 page in bloger blog. look at the #Step7:hope you will get it. Thanks for taking interest in our blog. We also wanna see you here for a long time. Thanks for your kindly comments. Thanks so much bro Hafeez for the useful tricks, it's very easy for newbies to understand, that's why i always like reading your posts. Keep posting. Thanks Alot victor Bro that you like our posts. We love to communicate with you all the time here with PBT. Thanks for Appreciation and hope to see you here again very soon. Mh, interesting. I followed the steps and now have 21 pages, no problems with that, nice cheat indeed. I just don't think you can get any more than that...: If you follow the steps again, when it comes to create a new page, you can't save it since it will tell you you already got 20 pages. I might be missing the obvious but I think 21 is the max. Nice tips, but one question creating 22 page means deleting 2 other pages and restoring it again? it helped me soooooooooo much! thanks. Great share.Very helpful for newbie. I bookmark your post. In future if my blog reached 20 pages i will use this tutorial. Thanks a lot friend, It really worked !! 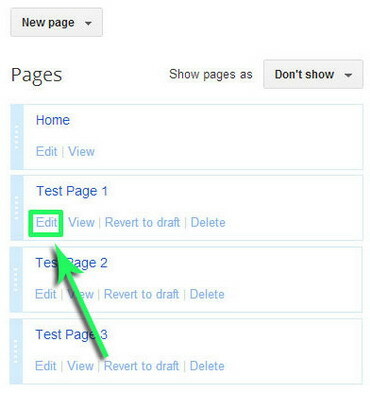 i've created as test 22 and there is a button on right side of the pages to display 10, 25, 50, 100. So i guess now we can create by default 100 pages. Should be true even more because Google admins are billionaire ,we are poor and they can buy all the internet storage in the world.